Until the nineteenth century, European navigational knowledge of the Gulf, including the Strait of Hormuz, which is currently one of the world’s most important and busy shipping passages, was limited to certain routes vital for commercial shipping. Charts compiled for oriental navigation showed only one route, which was the best-known and considered the safest sea passage. The route ran along the Omani coastline to the Strait of Hormuz, then along the Persian coast, with Kharg Island indicated as a watering station, and was shown on maps by a single line of soundings, which lacked further detail. 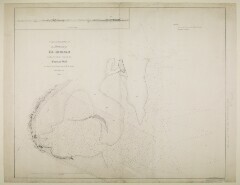 The first methodical survey of the coastal topography of the Gulf was carried out by the Bombay Marine’s officers and took place between 1820 and 1829. 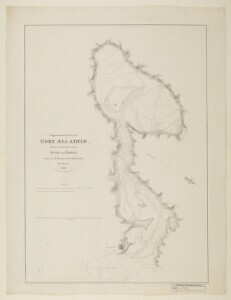 The purpose of the survey was to create a thorough body of information on the Gulf and its shorelines for navigational, military and commercial purposes.The officers were instructed to record essential data for ship navigation including documentation of coastal topography, for example uncharted shoals, soundings and prevailing winds and currents. They also produced detailed plans of harbours and recorded the geology, the centres of trade, as well as the tribal and religious affiliations of the populations on either side of the Gulf. This held particular importance for the British because of the contemporary European perception that the coastline was especially dangerous. The works began in October 1820 off Ras Musandam, Oman, under Philip Maughan’s command. After his departure the officers in charge were, respectively: John Guy; George Barnes Brucks; and Stafford Bettesworth Haines, who completed the survey and returned to Bombay at the end of April 1829. The Discovery, Psyche and Benares – three ships used for surveying by the Bombay Marine The navy of the East India Company. – initially carried no survey equipment and had to be specially furnished. Officers in their reports, for example, complained about the poor quality of the instruments provided to complete the task at hand. Furthermore, vessels were neither designed nor adapted for this hazardous assignment, which made the task even more difficult, especially for work carried out on the Arabian side of the Gulf. The coastline from Ras Rakan to Kuwait, often referred to as the Pirate Coast, was reportedly particularly difficult because of its shallow and rocky shoreline. Interestingly, the survey ships were not used exclusively for surveying, so the work suffered numerous interruptions on occasions when ships were required elsewhere, such as in transport duties to the Persian coast and Muscat. As a result, progress was slow. Additionally, the undertaking was frequently disrupted by severe weather, which forced the surveyors either to change plans or to run for shelter to established British bases – first at Basidu (Bassidore) on Qeshm (Kishm) and, after 1823, at Bushire. It was found impossible to engrave these characters with accuracy, as they are not inserted on the charts of the survey sent to this country, but were received upon a separate paper, and the spelling of the names of many places attached to the Arabic characters on this paper, differed so much from any spelling of the names of places given on the charts that in several instances no affinity could be perceived between them. 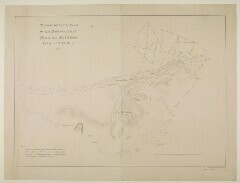 The Bombay Government’s wishes were eventually put into effect with the engraving of the two-sheet general chart of the Persian Gulf Historically used by the British to refer to the sea area between the Arabian Peninsula and Iran. Often referred to as The Gulf or the Arabian Gulf. in 1832. As well as the compiled manuscript charts and plans, the administrative progress reports submitted to the Marine by surveyors were sent to London for publication and were issued between 1826 and 1832 in engraved form by the East India Company (EIC). Together with descriptions, they were incorporated into new editions of the EIC’s sailing directions. Later in the nineteenth century, the charts and plans were modified by new hydrographic surveys and astronomical observations and updated in each successive edition of the Persian Gulf Historically used by the British to refer to the sea area between the Arabian Peninsula and Iran. Often referred to as The Gulf or the Arabian Gulf. Pilot, which was issued by the British Admirality between 1864 and 1932. The topographical information gathered in the 1820s surveys formed the basis of European knowledge of the Gulf for almost a hundred years. It was only with the compilation of The Persian Gulf Historically used by the British to refer to the sea area between the Arabian Peninsula and Iran. Often referred to as The Gulf or the Arabian Gulf. Précis by Jerome A. Saldanha in 1903 and the later publication of John Gordon Lorimer’s Gazetteer of the Persian Gulf Historically used by the British to refer to the sea area between the Arabian Peninsula and Iran. Often referred to as The Gulf or the Arabian Gulf. , Oman and Central Arabia, published by the government of India in 1908 and 1915, that this navigational knowledge was surpassed.